​Mother nature has let out some epic storms the past few months across the country. You all have gone above and beyond with handling all the claims coming through and we appreciate everything you have done so much. It's amazing what we have all accomplished in the past few months and it is all because of your dedication and hard work. Thank you and keep up the great work! You know ‘em, you love ‘em, and if you have a state adjuster license then you need ‘em. Paying for CE credits can really harsh your mellow, so we found free continuing education credits to help you reach your requirements. Click here to register . Additional dates and locations available. As an adjusters, you never know what is going to happen until you actually get to your inspection. Your safety is a top priority and should always be taken seriously. Make sure you have an appointment set with the insured before you arrive for an inspection. Know the area the inspection is located and you don't feel comfortable, have someone with you or speak with your account manager to work something out. Check all your equipment. If you do roof inspections, make sure your equipment isn't damaged where it is unsafe to use. If you have any questions, never hesitate to give us a call. AAn Inc will partner with you. Do you have marketing skills? If so, this is for you. What other IA firm offers you the opportunity to market and get a percentage of new business? Shoot us an email for more information on how it all works. Do you have the right tools in your adjuster tool kit? When was the last time you check it to make sure nothing is missing or damaged? Bet you are thinking about it now. Today we are going to go over the essentials you need in your kit and a few extras. Some things will always need a backup, right? Ok, there are too many questions in this introduction, so to keep from asking any more, let’s get to it. You might be thinking – I have a phone camera, I don’t need an extra camera. You always need a backup camera, always! As an adjuster, you never know what will happen so you want to always be prepared. It doesn’t need to be super fancy, just something that will take a good photo and has a flash. You might find yourself on the side of a road documenting an accident and you want to be visible. It’s a safety precaution that you should never skip on. And the reflective highlighter look is all the rage in fashion. You always have things that need to be measured. Many adjusters have a few measuring tapes in their kit with a measuring wheel. Now, if you are big into using techy stuff instead of the old school tactical gear, there are a few measuring apps that do a great job. They can do the job of a measuring wheel as well as a measuring tape and you can apply measurements to particular items in images. We are working on a review of such ups, so stay tuned for that little gem coming up. A simple device that works wonders to keep your documents clean, neat, and organized. I would skip the manilla file folders or anything that thin. Look for something thicker that has something to secure it closed. It needs to be able to hold up to life in bag that get moved around a lot. Nothing is worse than handing someone a very important document to sign and it’s bent, dirty, and tattered. Somethings just need to be jotted down, so keep a notebook in the bag. To save space, look for the notebook folders that also come with a clipboard. That way everything is together in one place. Ever need a pen and can’t find one? Or have 2 pens in your pocket and not one of them wants to work? It happens. We swear they grow legs and just walk away. Always good to have extra pens. Again it’s all about being prepared for any situation. This might be an item to live adjacent to your tool kit, but you will be so glad you have it when the situation arises. If you do roof inspections, you probably already have rope on hand, but it you don’t you still want to have some type of tow rope handy. It all comes back to that being prepared thing. When you are an adjuster, you never know what can happen so it pays to be ready for anything. You might want a few of these, they tend to go missing as well. A small flashlight that can fit your pocket or on your adjuster tool belt (if you carry one) is perfect for lighting up dark areas for photos or just when you work at night. Head lamps are great to, to have in your kit. Things run out of power and you need to keep them charged. A portable charger and a few extra charging cables will save you from any low-battery crisis. As far as essentials go, the items listed above are what you need. There are a few more if you are working roof claims like shingle gauges and a pitch locator – available for purchase at our Adjuster Store. 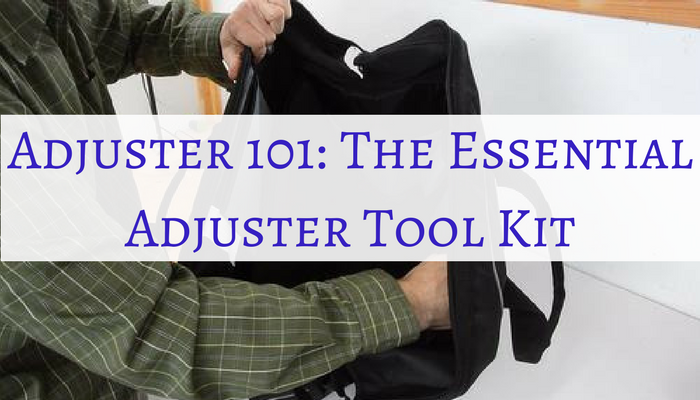 Comment below with any other items you would add to a basic adjuster tool kit. Join our Adjuster Team! We are always growing our team and would love to talk to you more about it. Contact Ben the Recruiter Guy at bbarker@aanadjusters.com or give us a call at 865.573.7923 and get all the details. Can’t wait to hear from you! On December 1st and 2nd, AAN, Inc. is hosting a two day Xactimate 101 class. If you have any interest in learning this software, please plan on attending. We look forward to see you there. What: AAN, Inc. is hosting a two day Xactimate 101 class. How much: $250 per person. What is required? : You must at least have a lap top with Xactimate 28 already installed on it. You can install a temporary demo version, but this must be installed before you arrive to class. Also, it is a good idea to bring an extension cord. Who: This class is open to anyone that would like to know how to use Xactimate 28. Adjusters & Contractors are welcome to attend. If you are interested, please send an email to gcabaniss@aanadjusters.com. On November 11, 2015 Claims Adjusters 411 launched our new website. Stay tuned for more news and information. We welcome any suggestions for resources you would like to see on the site, or feedback on the site layout.